gla.MAR.ous » Holiday Shopping Events! Hey loves! This weekend will be super busy as gla.MAR.ous™ is involved in 2 shopping events. What a great time to get your holiday shopping done. The holidays will be here before you know it and what better gift than a chic gla.MAR.ous™ headband for your friends and family! One of the sponsors for this event is The Dress Recycler, a fashion writer/stylist who specializes in vintage clothing. gla.MAR.ous™ will be here with our holiday collection! Meet and greet independent designers, mingle with fashionistas, and have some fun! This event benefits St. Joseph’s Children’s Hospital, why not come out and find a special gift while supporting a great cause! There will be all sorts of vendors from fashion accessories to holiday decor. Come shop our holiday collection while listening to Christmas carolers and sip on some hot cocoa. 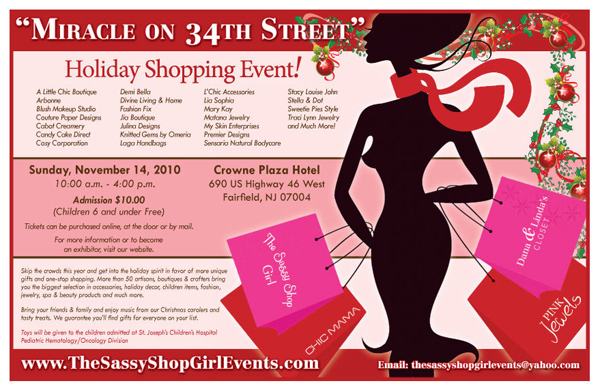 There will be tons to see, fashionistas to meet, and great gifts for friends and family! Hope to see you all at the events! I wanted to post a photo I received from d.e.e.nboutiques photoshoot! Here is model Alba wearing our Amelia headband in black and our Fringe top in black. So happy to announce the gla.MAR.ous™ fringe top that everyone has been asking for will be available on our webstore later this week! We will have these also available for our customers at these 2 shopping events!